First, can you make money with your computer? In answering this question, let's look at some guesstistics (like statistics but based on debatable facts). There are approximately 200,000 Apple computers out there. Probably half (my guess) of those were bought by persons convinced fame and fortune would be theirs. In actuality, I doubt 1% of those persons are earning an income from their computer. So, the answer to our opening question is "yes" you can make money. What I hope to address in this article is those pitfalls that befall the other 99% of aspiring programmers. Certainly, the first thing you must own is a computer. It should reflect the average computer owned by the marketplace to which you wish to sell. Currently, for the Apple, this is a 48K Apple II plus with at least one disk drive. For development purposes, you may require additional hardware and software. Of course it depends on what you're developing, but I recommend: a 16K Ram card, a graphics tablet, a good monitor, a good assembler (I as well as most other professional authors I know are partial to Lisa 2.0), if writing in basic: an Applesoft compiler and perhaps a 3-D graphics package. Another thing that is required and is usually a little rougher is time. In general, it is safe to say that there is no way that a marketable piece of software is going to come out of two weeks work. I would guess at 2-3 months development time on a game and 6+ months for any sort of business software. Lastly, and most important of all, is talent. I see no way a Basic programmer, regardless of skill, is going to develop an arcade quality game. A Basic compiler will hide some inefficiencies, however, the Apple which just isn't that fast at animation anyway and really requires 6502 assembler. If all you know is Basic, direct your efforts toward non-performance critical software. Some business software and strategy games lend themselves quite nicely to Basic. One of my favorite games "The Prisoner" was implemented in Applesoft. In general make sure you're using an appropriate Language for the product you're writing. Also, make sure you're doing things fast enough for most Apple-ications. The best idea developed at great lengths using in-appropriate technology will not find a marketplace. I don't know … but I do know a good idea when I hear it. 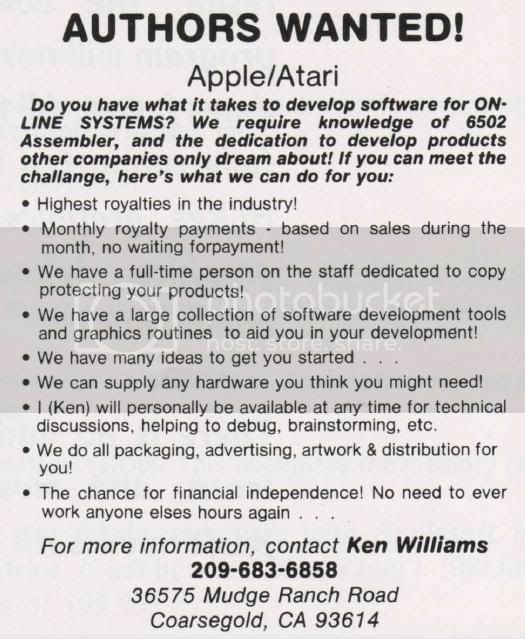 At one time, I thought I knew but then I ran an ad requesting software authors to call for ideas. 1000 responses later I'm completely burned out. Instead I'd rather cop-out by giving you the same guidelines I'd use if I were going to try to develop a new product. I see no way that my company would market an adventure game developed outside our own organization. This of course is due to our own line of adventure games toward which I'm slightly prejudiced. I would like to see someone take this form of entertainment one step further into actual real-time animated simulation. I also suspect a great deal could be borrowed from Dungeons and Dragons to heighten the realism of an adventure game. I'm fairly convinced (although I'm constantly proven wrong) that quarter style arcade games for the Apple are a passing fad. When someone owns a computer and has more than three minutes to play a game I think you have an obligation to challenge their mind as well as their manual dexterity. In designing an arcade game, design into it a great deal of variety. I think that at this time I would only be impressed with an arcade game with a very realistic scenario behind it. Perhaps many different arcade games linked together by some ploy and even a save/restore game feature such that when a portion of the game is mastered it never need be bothered with again. Sports simulations always seem to find a marketplace. I'm fairly convinced we shall not see a better Football or Soccer than my company markets, but will the day come when someone will implement a baseball game that can turn a double play? Still to be properly simulated are gold, bowling, ping-pong (I know it's been done but it's not in 3-D), arm wrestling, mud wrestling(? ), auto racing, boat racing, etc, etc. Most of these sports have been neglected because there is no easy means to control action or because the resulting game would be boring. Perhaps you have an idea? Realistic simulations of events will always be popular. For instance, Sub-Logics Flight Simulator (a favorite of mine). Simulations of this sort still need to be written. How about simulating piloting a helicopter, landing the space shuttle, or driving the Indy 500? A simulation in this vein should be complete with related instrumentation and realistic simulated motion. Before starting a project, give thought to implementing in such a way that a large portion of the code might be shared with future projects. A couple of things I might warn you about. First, stay away from products that have only some programming trick going for them. I put into this class some games I have seen lately that are boring but sell due to cute ideas with scrolling the Hi-Res screens. Gimmicks are nice but get old after a short period of time. Also at least if your intention is to market through my organization, stay away from hardware specific applications. For instance, I'd have a hard time mass marketing software to interface an Apple to a Porshe even though you spent six months getting it to work. There will always be a need for more software development tools. How about a debugger language for the Apple III which barely has a monitor, a 3-D animation package with clipping and hidden line suppression, a faster animation package, a complex debugger with conditional breakpoints for assembly program development, a generalized copy protection scheme or ??? I would like to see some other languages supported on microcomputers. For instance, RPG or COBOL. Also necessary are AD HOC query languages such as are available on the large mainframe computers. Also, and I'm not sure why this hasn't occurred yet, we greatly need some standardized ISAM file access techniques. The business software marketplace is still wide open. Especially needed are financial modeling and forecasting tools. I still haven't seen a personal finance package or a personal tax preparation package I'm happy with. Also what about software to back up a secretary in a standard office environment (taking messages, logging phone usage, scheduling meetings)? How about software to compute UPS charges for companies like mine that ship dozens of packages a day? What about standard costing software? Due to space limitations I will discontinue at this point listing possible products, but hopefully this will set you thinking. Please do not feel that if you have an idea and it's not on this list it has no market. First, I may not have thought of it, and second, I've been wrong more times than I can count. On-Line Systems is a publisher of software and behaves much the same as I envision a book publisher must. All software we market is written by some author who receives a royalty on it. If we publish a game which does not sell, the author does not receive a cent. Of course, our intention is not to publish software that does not sell, rather, we need to sell almost 500 copies of a product each month just to consider ourselves to have broken even. If you think you have a product that we might help you market, it should be submitted to use with whatever documentation you have on disk by mail. We look forward to receiving submissions such as this and will open it and generally form an opinion immediately. I have to confess to a certain amount of bluntness in dealing with authors. There are products that simply cannot sell in the quantities needed for us to make money. Also there are products that are fantastic, but simply do not fit our product line. In these cases, I will simply reroute you to a publisher who I feel can make you more money. Should On-Line Systems market your product, we will provide a tech-writer for the documentation, provide all packaging materials, copy protect the software, advertise the product, and help you find any hidden bugs. After you turn over a product to us, you do nothing but wait for royalty checks. We do require that we are the only organization allowed to publish your software for some period of time (usually three years) and that you take all possible action to keep the product state of the art. Also, you are required to fix any bugs that may turn up, as fast as humanly possible. Royalties are paid monthly based on any sales invoiced during the prior month and usually equal approximately 16% of the list price of the product. If you are now developing a product that you would like us to market upon completion, we would like to hear from you as early as possible. Usually, I can tell you immediately how well it will sell and whether or not we would be interested. It saddens me greatly the number of months effort I have seen wasted on products that never had a chance. I have a staff of terrific programmers in addition to myself that can aid you with technical support and suggestions. Also with hints on how to do things uch as making it easy to move your software to another computer later. We also tend to be great to "blue-sky" with about possible additional features in a product. Once I have some strong feeling that you will be able to make me money, I am willing to help you with items such as hardware. For instance, I have loaned several people ATARI'S with which to convert existing APPLE software. Unfortunately, due to the number of requests I get for this type of assistance, it is highly unlikely I will be able to to anything for you until you have proven yourself by actually implementing something. I don't think we have begun to touch the limits of the capabilities of the Apple computer, yet I suspect even more powerful machines may fall into the personal computer price range soon. There will be a great deal of money made by those with the creativity and foresight to provide the software needed by this rapidly expanding audience. Realistically speaking though, only a few persons have the talent and dedication required. I hope this article will have helped you decide if you have what it takes and to pick a direction.